CLIMsystems has worked closely with DSSAT to create a perturbation tool for incorporating climate change factors into the DSSAT software system. CLIMsystems has applied the latest CMIP5 data for temperature, precipitation and solar radiation for the globe and processed up to 40 General Circulation Model patterns for each variable for easy access in the DSSAT Perturb. In DSSAT Perturb you can choose an individual GCM or use the more widely recommended approach which is to apply an ensemble of models. You can also select one of four representative concentration pathways (RCP 2.6, 4.5, 6.0 and 8.5). 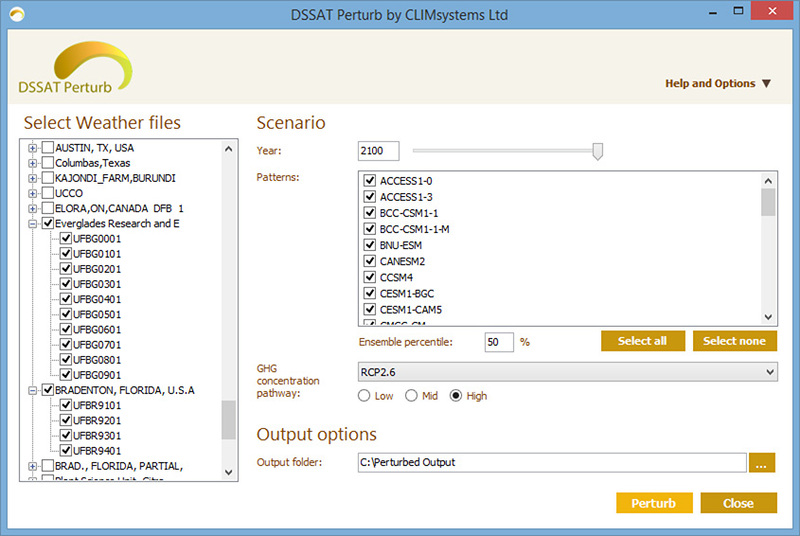 With DSSAT Perturb you can control the climate runs and save the perturbed data to an output directory of your choice. What can you do with DSSAT Perturb? You can easily and with scientific rigour, explore future climates against your DSSAT crop files. Simply select your weather file, the Global Circulation Model(s), create an ensemble if you wish to use more than one climate model (highly recommended), choose at representative concentration pathway (RCP 2.6, 4.5, 6.0 or 8.5), your year for analysis (to 2100) and perturb your weather file. You can ask 'what if' questions about how crops might respond to a different climate regime while controlling for other variables within DSSAT. For example, you may like to explore how precipitation, temperature and solar radiation may change in your area under a representative concentration pathway (RCP) of 8.5 in the year 2040. You can quickly change one or more of the climate change parameters (the GCMs applied, the RCP, the year) and run another perturbation and rerun your DSSAT model with the perturbed file. What areas are covered with DSSAT Perturb? There is considerable flexibility in the tool for exploring the latest CMIP5 climate data in the context of your study area wherever it might be. The pre-loaded data in the tool covers the world. What are the climate variables you can assess with DSSAT Perturb? The three key variables in a DSSAT weather file are precipitation, minimum and maximum temperature and solar radiation. CMIP5 climate data for each of these variables has been processed and is presented in DSSAT Perturb. For more details on the data underpinning the tool we encourage you to read the SimCLIM Data Manual.